Sapphire, a Nord thief, is a member of the Thieves Guild in Riften. She has a rather traumatic personal story and is thus a tough character, especially when it comes to repaying debts. However, she now feels somewhat at home in the guild, although she doesn't appreciate Vipir the Fleet's advances. Apparently, she got her name because of her penchant for the shiny gems: "They call me Sapphire because I love to steal them." "I'm really getting tired of your excuses." "Don't know why you'd help a stranger like that, but a septim's a septim... don't care where it comes from. You can tell Shadr his debt's been paid." or "You don't have enough gold to pay it off, and I'm not cutting any deals." "All right, all right. I guess I made enough from his shipment. No need to waste any more time threatening a stable hand. Tell Shadr he doesn't owe me anything." or "I don't care, a deal's a deal." "All right, all right! Take it easy. No idea why you'd care about a stranger so much, but this isn't worth a fight. Tell Shadr I'm forgetting about his debt." or "Ha ha! Are you kidding me? I've got the entire Thieves Guild at my back. What've you got?" If you become a member of the Guild yourself, she'll be quite defensive: "Back off, this action's all mine. No room for anyone else in the Guild on this one." When you ask her to cancel the debt, she'll propose a deal: "Why should I bother? I've already made a bunch of coin off of his shipment, so anything else I squeeze out of him would be a bonus. Oh... wait a second. I see what this is. You want me to cut you in or you'll rat me out to Brynjolf. Tell you what. I'll give you a share right now if you forget the whole thing." If you agree she'll be relieved: "Now you're talking. Oh, if you see Shadr, remind him he still owes me that debt." If you threaten her with taking the issue to Brynjolf, she'll take a scare: "Woah, woah. Calm down. Let's just think about this for a moment. Sigh. You win. Tell Shadr he can forget the debt." If you're the Guildmaster, she will be understandably nervous: "Oh, you heard about that, huh? Uh, sorry boss. I was going to speak to Delvin about cutting the Guild in, but I forgot. You aren't angry about it, right?" She'll be so frightened you will be able to get your way, whatever your choice: "Yeah, I figured it would be like that. Here you go." or "I got the message. Consider it forgotten, boss." Once the related quest is over, she'll relocate to The Ragged Flagon - Cistern. After waking up at 10am, she will spend four hours improving her blade skills in the training room. After wandering around the central area of the Cistern for another four hours she will enjoy a two hour dinner. She will loiter around until 2am, when she heads to her bed, which is just behind the practice targets. If you ask her what her real name is she’ll fake tough: "Look, I don't really know you. I don't even really know anyone here. Why do you care anyway? It's not like we're family. This is a business. Look, you want to know about me? All right, I'll tell you. I'll tell you about the time I was a young girl, barely out of her teens... living on a pig farm in the middle of nowhere. Didn't have a coin to spend between our entire family. Ate the same slop we fed our livestock." If you comment on how horrible that sounds, she’ll press on: "Oh, wait... it gets much better. How about the fact that our farm was attacked by bandits, and that they killed my entire family who didn't even brandish a weapon against them. Here's the best part. They took me as a prize, and violated me for a fortnight. Tossed me from bandit to bandit like... like..."
If you notice her distress she’ll pull herself together: "It's fine... I had to tell someone I suppose. Carrying around a weight like that... it hurts after a while. Cuts you inside like a dagger to the heart. Over time, I managed to gain their confidence. Then one night I grabbed a knife, waited until they fell asleep and cut their throats. I never returned to that pig farm you know. There's nothing for me there. So that's my sad story. What do you think?" If you press her for her name, she’ll be elusive: "Maybe one day, just not today." If you tell her the identity of her father, she will say: "I... I can't believe it. All those years on the farm, and my mother never told me about any of this. Words can't even begin to describe how much I appreciate you bringing this to me. Here, take this. I used to carry it for good luck, but I think you deserve it more than I do." 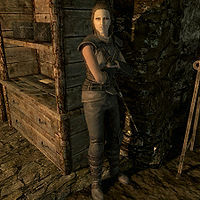 She wears the Thieves Guild armor, gauntlets, boots and is equipped with a steel dagger. True to her name, she also carries two sapphires as well as two lockpicks and up to 18 septims. Niruin: "You seem to be a bit closer to Brynjolf than the rest of us. Is he giving you any idea why this place seems to be falling apart? Sapphire: "If he does, he isn't telling me a thing. I've asked, but all I get from him are more questions. Niruin: "What about Mercer? Have you asked him? Sapphire: "No, and I'm not about to either. I value my life you know... you may want to remember that for yourself. Rune: "So I'm finally seeing you with a smile on your face." Sapphire: "It's this place. It feels like home. It's just nice to finally have something going right in my life." A note about her, entitled Eyes Open, can be found on a barrel alongside the Grindstone in The Ragged Flagon - Cistern. 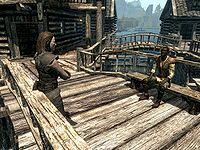 In the Dragonborn expansion, it is revealed that Sapphire is Delvin Mallory's niece and the daughter of the Raven Rock blacksmith Glover Mallory. If you tell her this by bringing her Glover's Letter, she will reward you with an exquisite sapphire. As the entirety of the contents in Glover's Guild room respawn, including the letter, you may repeat this quest as many times as you like, resulting in infinite copies of the Exquisite Sapphire. Sapphire may not talk to you during the quest Stabilized. See here for possible fixes. Esta página foi modificada pela última vez à(s) 14h54min de 15 de março de 2015.